They’re growing! After my last failure with seed starting, I was beginning to think I would never succeed as an urban, indoor, landless farmer. Yet, here they are. Clockwise from the top left: cilantro, shishito peppers, kale and parsley. The tomatoes, arugula, and basil didn’t make the photo shoot (in truth, the basil may end up a casualty here). The secret? Grow lights on a timer and the proper amount of nutrition. It’s that simple. Except it’s not because I have also become mildly obsessed with their well-being, to the chagrin of our poor cat. Upon waking, the first thing I used to do was feed her, but now she has to wait while I check the plants. Do they need more water? How much did they grow? Like any baby, when something is so tiny and fragile, every change is noticeable. In a few weeks, they will be ready for transfer to the Windowfarm, but I say this with trepidation like I’m sending them to preschool. The windowsill is cold – what if they don’t survive? One of the best things about participating in this Windowfarm endeavor is the crowd-sourcing, both for the information provided and the camaraderie. Once my seeds had sprouted, they grew to a certain point – about 1 inch – and then seemed to stop thriving. Beside myself, I uploaded their sad photos to the Windowfarm site and asked for help (which came almost immediately). The answer? Nutrients. 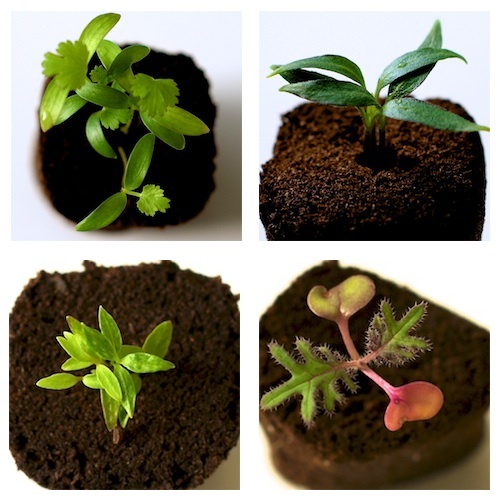 As the grow plugs are not soil, they only supply a support to the seedlings, nothing more. So, I was advised to add some liquid nutrients to their water supply in the form of Botanicare Pure Blend Pro which is a hydro-organic vegetative fertilizer custom blended from organic and natural sources of the essential major, secondary, and trace minerals that plants would normally find in good soil. Within a day of adding a tablespoon of this magical liquid to a gallon of water the seedlings sprang to life! Growing plants from seed has so far been an exercise in wonder – when (and if) the time comes, will I actually be able to eat these plants? I’m only half kidding here. Speaking of gardening, I came across this amazing article via MNN about the town of Todmorden in the UK that has landscaped its public spaces with edible gardens. Residents can harvest what they wish on an honor system and…. it seems to be working! The town of about 15,000 residents has the goal of becoming self-sufficient in communal food production by 2018. Love. And last but not least, the Brooklyn Botanical Garden has a lovely exhibition on….Terrariums! running until February 26th. The perfect winter outing. Click on their banner below for details. This entry was posted on January 20, 2012, 7:52 am and is filed under garden, Green, Windowfarm. You can follow any responses to this entry through RSS 2.0. You can leave a response, or trackback from your own site. Congratulations – they are lovely little plants! They are beautiful and I can hear the theme from Green Acres playing in the background. (OK, so that dates me–for all of you youngsters, it was a sit-com from the 60’s). Here’s hoping for a bountiful harvest. good luck! I am going to try this year. I haven’t done it in many years so good luck to both of us!